Enough feedback on my recent John Stewart item came in that I wrote a new, longer item on the gruff-voiced singer who spent his teen years in Claremont. After that comes a visit to two art museums, also in Claremont, and a Valley Vignette, not from Claremont, all in Sunday’s column. Norma Tanega, 80, is a longtime Claremont resident and musician (“Walkin’ My Cat Named Dog,” etc.). Her art is the subject of a Claremont Heritage exhibit that opens Saturday. I sat down with Tanega, a true original, for an amusing, awkward interview. That’s my Friday column. I remember the Claremont civic leader and former mayor, as well as telling the story of the 1987 explosion at an Upland apartment complex recently in the news again, in Friday’s column. You’ve probably seen Sumner House even if you don’t know its name; it’s the Victorian on a slight rise at First and College in Claremont. Don Pattison has been the host at the Pomona College-owned guest house, greeting visitors and living on the premises for 26 years. On his way out, he gave me a tour. Tag along in Sunday’s column. Wait, a column on a Monday? 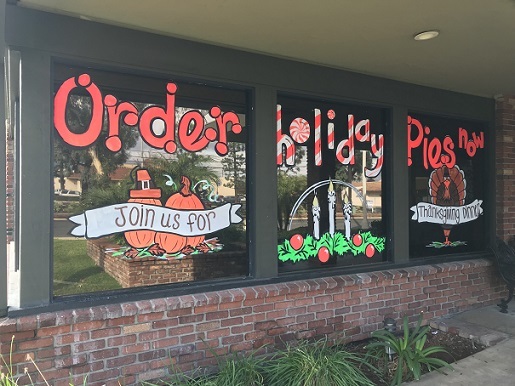 Well, after hearing from three heartbroken readers that the Marie Callender’s in Claremont had closed after 45 years, I stopped by the restaurant Friday morning, thinking that if they’d lost their lease, and that was the last day of the month, that might be the last day I could find someone on the premises. The owner happened to be there, answered all my questions and posed for a photo. I already had a Sunday column mostly done, which couldn’t wait, and have a column planned for Wednesday. What to do? So, after filing Sunday’s column Friday and breaking for lunch, I returned to the office and cranked out a Callender’s column, with photo gallery, in a breakneck 90 minutes. Bonus! I wish they were all this easy. In Claremont, I attended a very interesting panel talk last week about the darker side of the citrus industry, related to an equally interesting exhibit full of recently donated items of citrus memorabilia. The whole thing, including the donation, became Friday’s column. Few things in Claremont are more Claremonty than the Folk Music Center, home to instruments, classes, workshops, live performances and living history. I write about this local institution, founded in 1958, in Friday’s column. Tucked away on the Pomona College campus is a James Turrell Skyspace, a plaza where watching the people is as enjoyable as watching the heavens. I visit, repeatedly, and Stan Lim takes photos for Wednesday’s column. I wrote this prior to vacation while the material was fresh in my mind. And now I’m back. 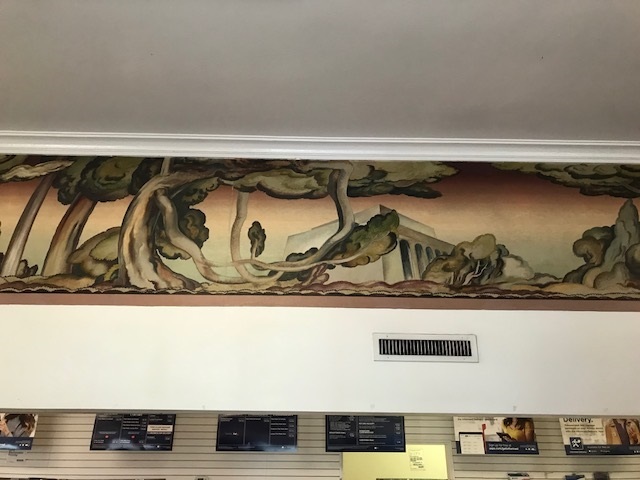 The 1930s mural in the Claremont Post Office that wraps around all four walls near the ceiling is sometimes said to depict the view from the four points of the compass. When I wrote about Milford Zornes in my column in January, I said that was the lore, but that his son-in-law hadn’t heard the story. 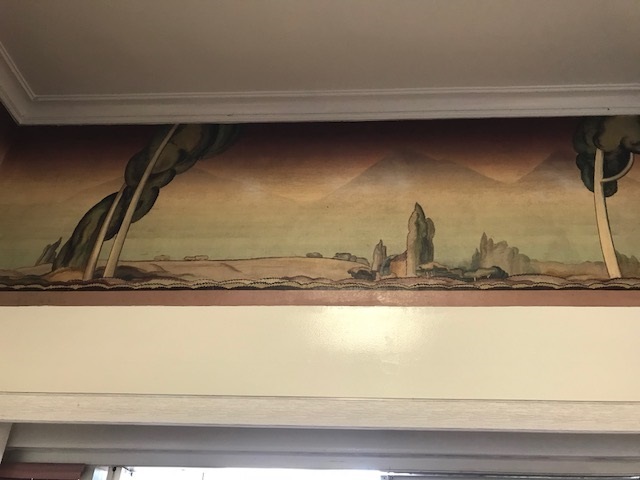 It’s probably true: In my files I later found a 2007 Claremont Courier story about a talk the 99-year-old artist gave to the local Democratic Club concerning the mural. 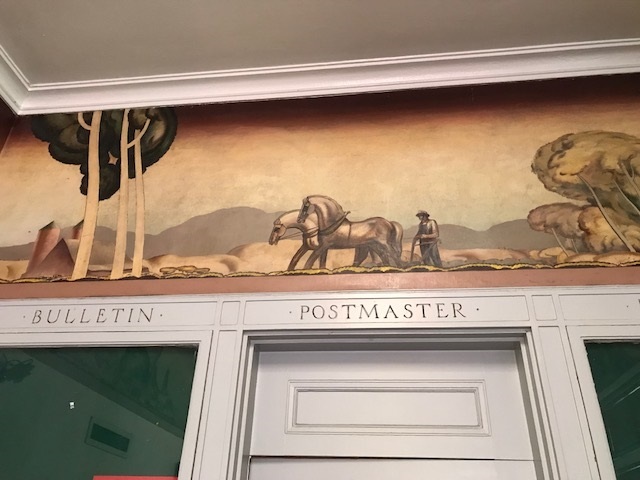 Subsequently I went into the Post Office, admired the mural anew and took photos. 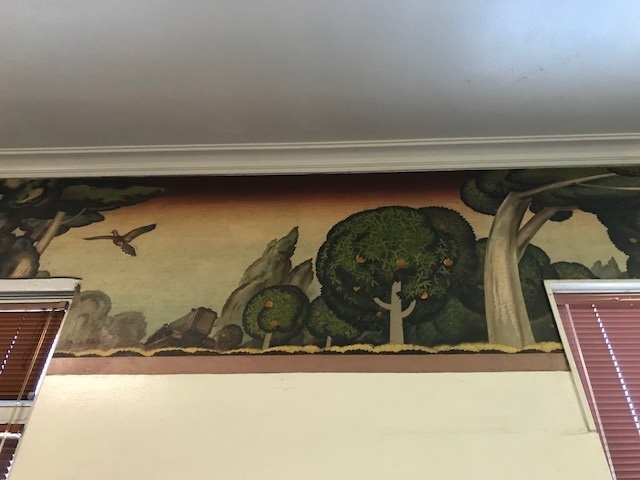 The mural is overhead, and much longer than single photos can convey, so consider my photos merely a general guide. This is the view looking north toward the mountains. This is the view looking west toward the former citrus area. Here’s the view looking south toward Chino. And here is the view looking east toward the colleges. “For all the criticism it took, I think that time has settled the fact that Milford was right about putting it on four walls and not one,” says son-in-law Hal Baker, who wrote the Zornes biography that was the subject of my January column. 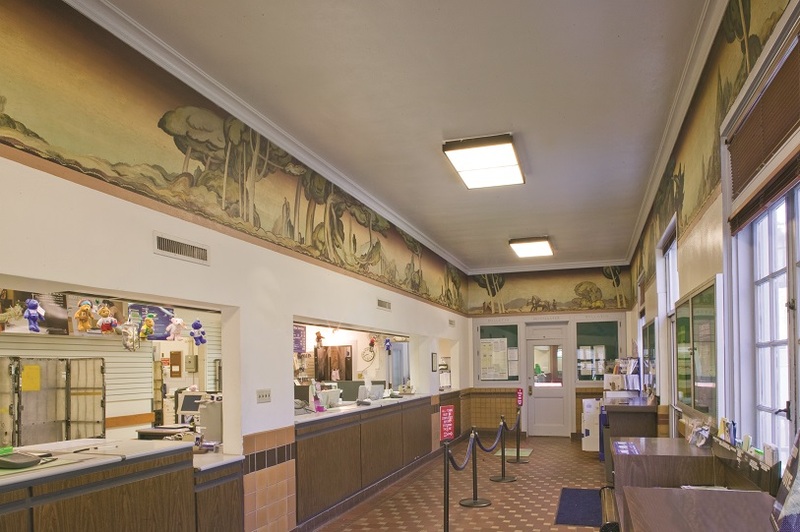 Have you visited the Claremont Post Office? It’s at 140 N. Harvard Ave., and well worth a look. You can get a dose of culture while also mailing a letter. Most years, there’s a Claremont Folk Festival, but not every year. This year there will be one. I write about it for Friday’s column, followed by some cultural notes, a plug for this blog and a vignette.